NASHVILLE, TN — It took Barbara G. Key only a little while of foster parenting Elijah and Jeremiah to decide to permanently adopt them. When they first arrived at ages 4 and 18 months, she could tell they had come from a very tough situation. 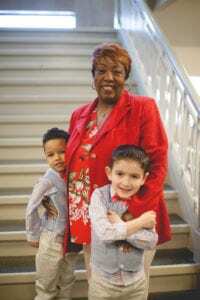 Barbara G. Key with her two newly-adopted sons Elijah, right, and Jeremiah, left. “They were non-verbal and would hide up under things. I’d find them under the bed clutching each other. They tried to eat dog food from the dog bowl. It was obvious they did not come from a pleasant experience. Now, they are happy, talking, hugging me, touching me,” Key said. Elijah went from calling her “Ms. Key” to “Nonna,” to “Mama.” Jeremiah calls from the next room to ask if he can have a peanut butter cracker. Barbara Key is an example of the kind of healing children can get when they have a caring adult in their lives. Ms. Key is a foster parent recruited through the Monroe Harding agency. The agency, which began in 1893 as an orphanage, now works to place children in foster homes, advocate for them and support both the foster parent and the children. The month of May is Foster Parent Awareness month and agencies like Monroe Harding want anyone who has a heart to help a child know that foster parents are given a lot of support when they open their homes to a child. Potential foster parents take a parenting course with tips on strategies that work for various personalities and ages of children. Taking the course does not necessarily commit a person to become a foster parent, but it’s a good way to learn about the work of the agency and how to be a better advocate and ally to children. and our volunteers babysit for the children on those days or help with summer camp we run. It’s a great way to dip your toe if you are considering whether fostering a child is something you’d like to do,” said Sarah Brock, Community Relations and Marketing Manager for Monroe Harding. “After adults take the course they say that every parent should be taking this course. We assign one support person to the foster parent and a second one to the child,” says Brock. Advice and assistance is available day and night for families who might have a question on how to handle a situation. “I appreciate the service the case managers there give to me. I can call at any time. If I need help with transportation I can call, or can discuss issues I might be having,” said Ms. Key. Further, the Monroe Harding commitment to the children they foster covers the child from birth to age 26. “Foster parents have to be at least 25 years old, pass a background check, can be single or married and have a space for the child to stay. Our goal is to have them long term. I was in foster care, I was adopted so it’s something very near and dear to my heart,” said Beere. Barbara Key had worked with autistic children as a social worker. But she did not know how many children who were not a ‘special needs child’ but who simply were caught in a family crisis and needed a foster parent. Then a colleague showed her the data on how many children needed placement. That was sixteen years ago and Barbara Key made the decision to start fostering children. She says she has fostered around 15 children. 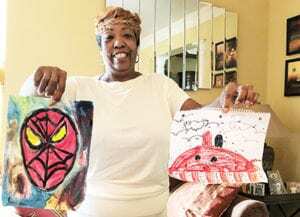 She has foster kids who are now grown and living in Arizona and Chicago who still call her on her birthday or when they find out she’s been ill.
Now she has an even deeper commitment – by adopting Elijah and Jeremiah as her sons. 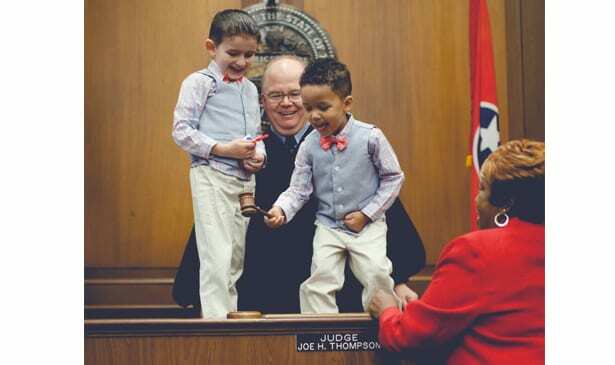 Barbara Key said her special moment in adopting the two boys came when the judge presiding over the adoption let them bang the gavel to signify the adoption was legal. And her daughter who has been a foster sister to many children, now has two new adoptive brothers.